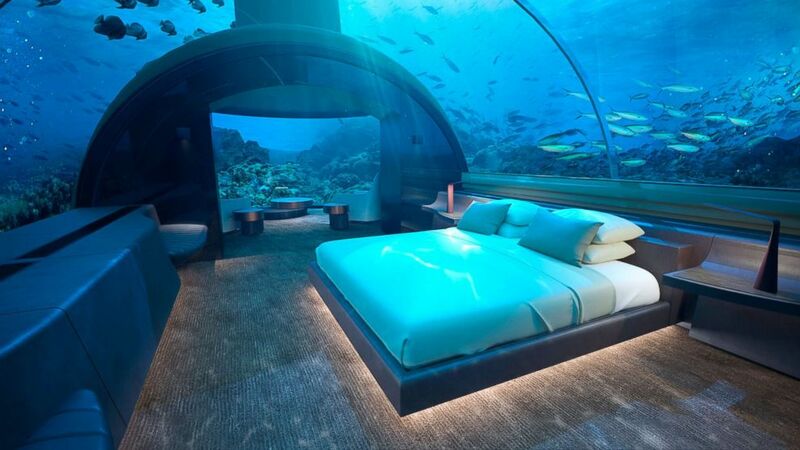 Travelers will soon be sleeping among marine life in an underwater hotel room in the Maldives. The residence at Conrad Maldives Rangali Island will be available later this year cost at least $50,000 per night. The rate is based on how guests customize the undersea experience, according to hotel representatives. The two-level suite is named The Muraka, which means “coral” in Dhivehi, the local language of the Maldives. The undersea bedroom floor sits 16.4 feet below sea level. The undersea bedroom floor sits 16.4 feet below sea level and includes a king-size bedroom, living room, bathroom and a spiral staircase that leads to the upper-level living room. The suite can accommodate up to nine guests. The design boasts 180-degree views of the Indian Ocean’s marine life. Muraka’s upper level features bedrooms, a living room, kitchen, bar and dining room, and a deck. “The Muraka marks our second venture in underwater architecture and technology, next to Ithaa Undersea Restaurant, which is celebrating its 13th anniversary this month,” said Ahmed Saleem, a director at Crown Company and chief architect and designer of the undersea residence. Muraka’s upper level features bedrooms, a living room, a kitchen, a bar and a dining room, a powder room, a gym and a deck. The upper level also contains an ocean-facing bathtub, ideal for soaking in views of the horizon. The suite, named The Muraka, will be located at Conrad Maldives Rangali Island and can run guests at least $50,000. On the opposite side of the villa sits a relaxation deck, complete with an infinity swimming pool. The design boasts serene, 180-degree views of the Indian Ocean and its underwater inhabitants.